Random Thoughts: Judicial activism at stake??? Recently a division bench of the Supreme Court reversed a decision of Haryana High Court. No big issue really, happens every day at the apex institution. But it created a furore and debate amongst the Constitutional experts of India. Why? Well because the Haryana High Court in its decision was dealing with temporary & casual gardeners which had been working for long and due to the inaction of the government, in regularizing their posts, were suffering for long. The High Court, in that situation, directed the government to regularize them, thereby giving them parity with the regular employees doing the same work. But then when the Government of Haryana appealed against this decision, the division bench, comprising of Justice A.K. Mathur and Justice M. Katju hailed it as an enrochment of legislative power and overturned the decision. Why? Because according to them the function of the courts is to enforce a law and not to make it; judges cannot create a right where none exists; it is the duty of the law-makers to ensure that proper governance takes place; etc. But I do not understand that the same Supreme Court, and that to a Constitutional Bench of it, lays down the law of the land in an eleborate judgment the guidelines to be followed by executive governments while dealing with regularization of casual employees, what is wrong by the High Court following the decision and deciding accordingly, when it is bound to decide the cases in terms of the law laid down by the Supreme Court? So its just like, we tell you to do 'xyz' when but we do not want you to do 'xyz'. The issue it raises about judicial certainty etc. no one has bothered to deal with but then a furore had created that judicial credibility is at stake. And this comes from no less terms but from a very senior and respected lawyer in the Supreme Court, Ms. Indira Jaising. She has raised important (but unconnected to this recent judgment) issues and identified a few items which according to her should be on the priority list of the judiciary. So let us start by what judicial activism per se means and then move on to whats wrong with the approach of the highest court of India. Judicial Activism is really a big word now in India. A random search at google on it brings 103,000 results. But what is it? And why at all is it so big? Well it evidences a pro-active judiciary i.e. one which goes beyond the Austinian exposition of law. The traditional notion of the law has been that the legislature creates/makes the law, executive enforces the law and the function of the judiciary is merely to interpret laws and clarify the legal meanings they carry. Doesn't sound too big right? This is exactly why the judiciary at times has tended to go beyond. Citing the reasons of executive in-action or absence of a law altogether to deal with a particular glaring issue, the judges have gone beyond their originally prescribed function of interpreting laws and have made laws themselves. This progressive march as an institution has been tentatively described as judicial activism. Why I say tentative because it has various fall-outs. Firstly all agree (whether constitutional experts or otherwise) that the laws enacted by the legislature are not sufficient to deal with all cases which come across the societal interactions and therefore there must be a sufficient degree of leverage available with the judges, at all times, to make an exposition of law which may not exactly be as the legislature contemplated or could not contemplate (being too busy I suppose) and therefore advance the understand and application of law further. So there is no question of judicial activism when it is always an acknowledged fact that the judiciary has to remain active beyond the confines of a statutory law in order to function effectively. Second comes the question of drawing the line. Where and when do we say that a particular instance of decision-making is pro-active or in line with Austinian understanding? Typically when now the Constitutions across the world confer these roles upon the courts. The Supreme Court of the United States, under Chief Justice Marshall,declared two hundred years back in Marbury versus Madison that the law of the United States is what the Supreme Court says it is. Courts, internationally, have taken clue from that and have been plugging the gaps which have arisen in the absence of laws. Then the Constitution of India gives wide and sweeping powers to the Supreme Court of India in terms of Article 142 and otherwise. It provides that the Supreme Court can "make such order as is necessary for doing complete justice in any cause or matter pending before it". Now given the fact that justice is a very wide and relative term, capable of justifying almost any proposition, it is imminent that the Court can go way ahead to perform its role as the Custodian of the Constitution. So when the Court does go beyond, why do we cry foul? When the entire country is divided in brick-bats about an issue which not only divides the country on Marxist lines of haves and have-not and provides for reservation, which is wrong with the Court contemplating the pros and cons of the matter which carries huge ramifications and puts at stake the future of the country as a whole, especially when the government is paying a deaf ear to it; yes I am referring to reservation. After all the Constitutional itself recognizes 'social justice' as an essential goal to the attained by the State. This is just one example of course. There are so many other important matters pending before the Court at all times. As my friend as a Law Clerk to the Chief Justice of India puts it, the Court is having a busy time now, having so many sensitive and important cases pending before it that he and the judges would be working even during the vacations. This definitely is an indication that law does originate from critical thinking and awareness to the sensitivity of the problem. So if we are not sensitive to the problem, why should others not be as well. At this point I am reminded of the selling of the Parliamentarian's votes, an incident that took place at the times Late Mr. Rao was the Prime Minister. At that time the Supreme Court refused to look at the matter, being an internal matter of an august institution of India, the Parliament. But then when the matter came up again and that was as regards the internal functioning of the Parliament, expulsion of members and other grounds, the Court was obliged to interfere to the extent of pointing out the rules of fair play and then departing with grace by leaving the matter to the wisdom of the legislature to deal with it. I do not think this is an encroachment on any one's power or domain. Way back in 1973 when the Court laid down the 'basic structure doctrine', many experts objected to it on the grounds of legitimacy i.e. 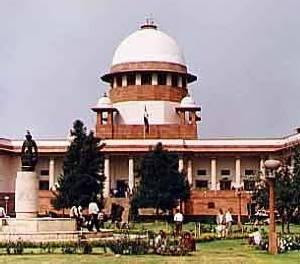 who gave the Supreme Court the power to declare that there is such thing as a basic structure in the Constitution, where there is no mention of such either in the Constitution or in the Constitutional Assembly Debates, which record the deliberations of the members of the Assembly which framed the Constitution. But then, why do people not understand that there is a need to change with the times. Animals adopt and humans change. Then why should the law not follow the course? The Constitution is not meant to be a book which will contain the same text and same meaning even after decades and centuries. In order to make it meaning either it has to be revised or given life to by meaningful interpretation which is adaptive to life's sensitivities and the changes in human outlook and behaviour and also to conform to the aspirations that a nation carries, not to mention the national goals of growth and development. Here I conclude, perfectly in favour of judicial activism, which in turn is cross-regulated by the legislative interventions in the form of enactments which keep coming from time to time and adapt, modify or over-rule the law laid down by the judges. Unless a path of active involvement in the national interests; unless issues plaguing huge cross-sections across the country are timely addressed (which perhaps a busy executive finds hard to keep pace with), growth and justice in the real sense of the terms cannot be achieved.